Looking to get some extra presents under your tree? Treat Santa with something besides those boring milk and cookies. My Chocolate and Caramel Pretzels will do the trick. Place them out with a glass of sparkling champaign and he might leave even more gifts. Santa will love with these sweet and salty treats so much that you might find him snuggled up on your couch Christmas morning. Directions: Ganache: Using the method of a double boiler, melt chocolate – place water in a small sauce pot and bring to a bowl. Find a metal or glass bowl that fits over top the pot. As the steam rises from the boiling water, it will melt the chocolate. Once the chocolate is melted, turn off the burner and add in the cream and salt. Whisk to combine until the mixture has a silky sheen. Caramel Dip: Use the same method as the chocolate to melt down the caramel. Once the caramel is melted, turn off burner and add in the cream and salt. Whisk to combine until the mixture has a silky sheen. Making the Pretzels: Pour each of the sauces into a tall glass for dipping. It would be best to pour while the mixture is still warm. If the mixture starts to firm during the dipping process, place into a microwave for 10-15 seconds to loosen the mixture. Stir until it has that silky appearance. Lay out a piece of wax paper on a baking sheet. Spray with a non-stick cooking oil. Pour each of your selected garnishes in a shallow bowl. Dip pretzel in your choice of sauce, allow the sauce a few seconds to drip, move over to your garnish and sprinkle all over the dipped section of the pretzel. Place on the wax paper lined baking sheet. 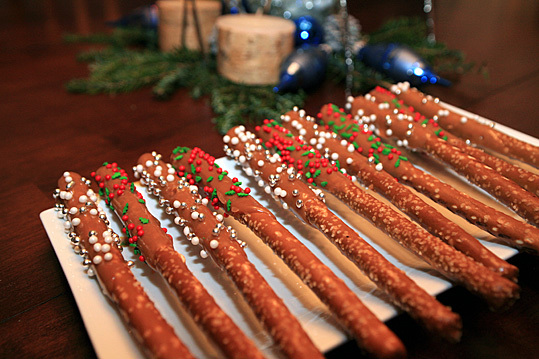 Continue with the remaining pretzels and dip. Move baking sheet to fridge and allow 1 hour for the dip to firm and set. You can even do a chocolate and caramel dipped pretzel. Start with the caramel. Once the caramel is firm, dip into the chocolate. 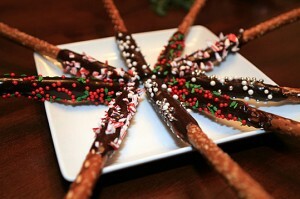 Present these sweet and salty treats on a plate or in a goody bag tied together with holiday ribbon. Enjoy!